We are proud to offer one of the best collections of clip art on the web. Simply browse through the below clipart and right click on the graphic you want. A young angel with curly blond hair and blue eyes flies through the air. She wears a white dress and has white wings. There is a golden halo around her head, and she rings a bell that is surrounded by six-pointed stars. A flaxen-haired baby angel has gold-rimmed wings and wears a lavender dress. She has a gold halo above her head and she holds a shiny pink Christmas ornament tied to the end of a branch of a Christmas tree. A blond-haired angel with blue eyes, white wings, and a golden halo holds a yellow horn. There is red and green holly on her flowing white dress. This is an image of a skinny green Christmas tree. It has three round ornaments. One is colored red, another is blue, and the third is yellow. In his swaddling clothes, a sleeping baby Jesus lies on top of golden hay. The background is a dark blue nighttime sky filled with twinkling stars. This is a red bell with white designs on it. It is in front of a gold-colored background. This is an image of a sprig of holly. It has red berries and green leaves. This is a black and white image of two candy canes and a pointy party hat. The party hat has three five-pointed stars on it. This is a black and white picture of a gingerbread man with a sprig of holly behind it. The gingerbread man is smiling, and it has three stars on its body. This is a Christmas wreath colored black and white. It is circular and it has round ornaments decorating it. This black and white image depicts a Christmas tree decorated with three round ornaments and two twinkling stars. There is a large bow in the foreground, and three stars shine to the left in the background. This is a picture of a round Christmas ornament in black and white. It is shiny, and light twinkles off of its surface. This is an image of two lit candles, one skinny and orange and the other wide and yellow. The skinny candle is placed in a tall holder, and the wide candle is placed in a short holder. There is a oval-shaped background colored olive green. Depicted is a candy cane. It is striped with green, yellow, red, and blue. This is a picture of two traditional candy canes. The candy canes are striped with red and white. This is an image of two chestnuts. The chestnuts are brown. This is an image of three large chestnuts. The chestnuts are brown with beige-colored centers. A child wearing a heavy brown and olive winter coat and a blue scarf stands next to a snowman. The child holds a large candy cane. The snowman has a green pot for a hat, sticks for arms, and golden hay for hair. This is a bright green wreath decorated with red holly. In the foreground, there are three lavender Christmas bells with purple bows. In the background, there are three twinkling stars. This template is a Christmas-themed border surrounding a space of white. The border is decorated with bells and ornaments along with green, yellow, and red stars. This is a template for a Christmas card. On the card there are two red angels blowing horns, sparkly stars, and golden berries. The card is surrounded by a blue border. This is a template for a Christmas eCard. The card has a white space to put a picture and a blue background. In the foreground of the card, there are two snowman wearing red hats and scarfs and a third wearing a yellow hat and scarf. A Christmas elf paints a series of green and blue tree ornaments. The pointy-eared elf is wearing a pink, lavender, and purple dress along with a pointy tasseled hat. Two elves hold a Christmas present wrapped in a yellow gift box with red polka dots and a blue bow. One elf wears a red and blue outfit, and the other elf wears a blue and green outfit. This template is a frame for a card. Around the white space at the center of the card, there is a gold and yellow border decorated with stars. There are also two candles, one red and the other purple. This template is a series of three identical Christmas frames. Each frame is square with a gray border, and each frame has a picture of a snowman wearing a black top hat and a red scarf next to it. This is an image of a Christmas present. The gift box is wrapped in paper striped with red and white, and there is a red bow tied around the box. Christmas gifts fill a large green sack decorated with golden stars. In the gift sack there is a brown teddy bear, a blue toy bunny, a gift box with a red bow, and yellow tree ornament. A dad wearing a blue shirt stands on top of a ladder as he strings up Christmas lights. The bulbs are red, yellow, green, blue and purple. At the bottom of the ladder, a young boy wearing blue jeans holds the end of the lights. This is an image of two bulbs on a string of Christmas lights. One bulb is blue and the other is green. A woman wearing a red cocktail dress holds a glass of wine as she winks. She has flowing brown hair and a pair of black satin gloves cover her hands. Beside the woman, there is a Christmas tree decorated with candy canes and blue bows. This is an image of a Christmas present wrapped with shiny blue paper. A bright red bow is tied around the gift box. This is an image of two Christmas presents behind an empty shopping bag. One gift box is wrapped with yellow paper and a red bow, and the other gift box is wrapped with red paper and a silver bow. This is an image of a Santa’s sleigh. The sleigh is colored bright red and has yellow trim. The letters “SC” are engraved on the side of the sleigh. This in an image of a Christmas ornament. It is a golden star tied with a red bow at the end of a string. This is a red Christmas stocking. It has fluffy white trim. A red Christmas stocking with white trim has gifts sticking out of it. There is a green gift box with a pink bow and a candy cane striped with yellow and red inside of the stocking. This is a black and white sketch of three Christmas stockings. Each stocking is hanging from a nail. Depicted is an evergreen Christmas tree. It is decorated with yellow, orange, pink, and blue ornaments. A gold star sits at the top of the tree. This is an evergreen Christmas tree decorated with round and red ornaments. In the foreground, there are two gifts: a teddy bear wearing a red Santa hat and a purple present tied with a bright red bow. This is an image of a silver star ornament meant for the top of a Christmas tree. The star is decorated with blue, orange, purple, red, and yellow accents. This is a verdantly green Christmas tree topped with a red star. The tree is decorated with round yellow and red ornaments. This is a green Christmas wreath decorated with red holly. There is a red bow tied around the top of the wreath. This is an image of a green Christmas wreath. Red holly berries festoon the wreath. A black and white parent penguin wearing a pink scarf carries a Christmas tree through the snow as two baby penguins follow closely behind. All three penguins wear multicolored hats. The background is purple. A light blue cartoon star with wide eyes and a wide smile holds Christmas bells. The bells are lavender and have a purple bow tied around them. On a patch of brown soil, a bunny rabbit prays in front of a golden cross. The background is a blue sky with two fluffy white clouds. A wooden cross rests in a hatched egg in front of an unhatched egg. The eggs are in a nest filled with hay. This is an image of a golden crucifix in front of a lavender background. The crucifix has a red roped tied through a clasp. An elf sits on the edge of a red sack decorated with sprigs of holly. The sack is filled with gift boxes and candy canes. The elf wears a yellow, green, and blue outfit along with a pointy purple hat. This is an image of a snowman. The snowman wears a red Santa hat, a red and green scarf, and a pair of gray boots. It has a carrot for a nose and sticks for arms. Depicted is a Christmas gift. It is wrapped with orange paper with geometric designs on it. This is an auburn-colored gingerbread cookie. The gingerbread man has two big eyes, a smile, and two pink buttons on its body. This is a brown gingerbread house topped with a roof of white frosting. There is a red wreath with a green bow hanging from the door and three yellow windows on the face of the house along with several other multicolored accents. The house sits between two green trees. This is a smiling brown gingerbread man coated with creamy frosting. It has a big green bow tie and two red hearts for buttons. This is a blushing brown gingerbread man with white lacing, a smile, and two sparkling eyes. The gingerbread man has two buttons, one red and the other green. This is an image of a gold cross. It is in front of an orange cross. Baby Jesus is in his cradle on top of a blue blanket. He points to a twinkling star just out of his reach. A golden lamb smiles next to the baby Jesus. This is a black and white image of Mary and the baby Jesus. She is wearing a cloak as she stand over the baby Jesus lying in his cradle in his swaddling clothes. This is an image of an adult Jesus. He has long brown hair and a black beard. He wears flowing white robes and holds a shepherd’s cane. Jesus hangs from a wooden cross. He has a look of agony on his face and a crown of thorns atop his head. This is an image of Jesus wearing flowing blue robes and a white shawl with his arms open. He has long brown hair and a black beard. Depicted is a golden Christmas bell with a red bow tied at its top. The bell is surrounded by red, yellow, and blue stars. A little boy with brown hair is wearing purple overalls. He is smiling as he holds a candy cane in one hand and a golden star on a stick in the other. He is surrounded by multicolored accents. This is an image of little white lamb kneeling. It is in front of a blue background. This is a picture of an unknown person in a purple shirt holding a rosary and a Bible. The cover of the Bible is red, and the rosary is gold and has a cross at the end of it. A priest’s hands hold a beaded rosary. The rosary’s beads are yellow and a crucifix hangs from the end of it. This is an image of Rudolph. He has a bright red nose and big antlers. In the background there is a town atop a snowy hill and stars twinkle in the night sky. Wearing his traditional red outfit, Santa is covered in soot as he nears a lit fireplace. At his feet is a blue gift sack decorated with sparking yellow stars. A long-bearded Santa Claus hold a stuffed purple elephant in one hand. In his other hand, he holds a blue sack full of gifts like candy canes, teddy bears, and drums. A cartoonish Santa Claus with a big gold belt buckle checks names off a long scroll. There are three multicolored gift boxes at his feet: one purple, another orange, and the third green. From outside, Santa Claus watches through a window as a little girl with a blue dress and a blue bow in her hair grabs a purple present with a green bow out from under the Christmas tree. The Christmas tree is decorated with red ornaments and gold garland. In his red coat and hat, Santa holds a paint palette as he paints a picture of a Christmas tree on a canvas resting on an easel. The green tree in the picture is decorated with golden ornaments that have red bows tied around them. This is a side profile of Santa and Rudolph looking at each other. Santa has a big white beard and a heavy red coat, and Rudolph has a shiny red nose and a gold collar. Above Santa and Rudolph, “Merry Christmas!” is written in blue. A red-coated, red-hatted Santa Claus trims a Christmas tree. The tree is festooned with yellow garland and red, orange, blue, and purple ornaments. A short Santa Claus takes presents from a red gift sack filled with presents. In his hands, Santa holds a red and green stocking, candy canes, and a golden star. There are two red gift boxes with yellow bows along with a blue gift box with a pink bow at Santa’s feet. Santa Claus rides a brown reindeer with silver antlers over the snow. In the background, there are twinkling gold stars. Santa wears a red coat with a black belt and a big golden buckle. He holds a small green Christmas tree. Above Santa, “Christmas!” is written in red. This is an image of Santa’s sleigh. It is gold-colored and filled with gift boxes colored purple, green, and red. There is a blue background. In this wartime poster, Santa wears a metal battle helmet and holds a parcel in his hand. 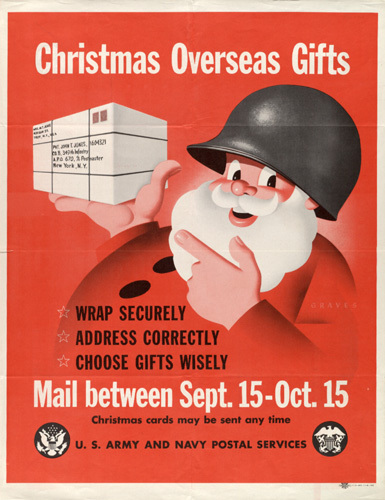 At the top of the poster, “Christmas Overseas Gifts” is written in white on a red background. The rest of the poster provides directions from the US ARMY AND NAVY POSTAL SERVICES. This template is a border for a Christmas card. There is an open white space in the middle surrounded by a wavy blue border. At the bottom in the foreground, there is an image of a snowman playing a green accordion. This is an image of a snowman wearing a red Santa hat. The snowman has two coal-black eyes, a carrot for a nose, and pebbles fashioned into a smile. This image depicts a kneeling woman wearing a white robe with a blue cloak and a red hood. She is praying in front of a gold background. This is an image of a green and red Christmas stocking decorated with gold stars. There is a small silver horn tied at the top of the stocking. A stocking with a pink and green pattern is stuffed with Christmas gifts. Inside the stocking there are multicolored gifts and candy canes. Santa Claus wears a purple backpack and rides a red surfboard. Blue waves rise behind him. This is an image of a teddy bear wearing a fluffy blue hat and coat along with a purple scarf. In front of the teddy bear is a stuffed snowman wearing a purple coat and a blue scarf. This picture depicts a brown teddy bear with a blue bow in her hair wearing a blue dress. She holds a red and green stocking filled with red and white striped candy canes. A bird with a red head and a light brown breast perches on a tree branch in front of a bright blue sky. In the distance, a small red sun shines. This is an image of a green Christmas wreath. There is a red bow at the top of the wreath and a bright ribbon is tied around the rest of the wreath. This image depicts a green Christmas wreath with a red bow tied at its bottom. The wreath is decorated with small, multicolored gift boxes. This is a template for a Christmas card. There is an empty white space in the middle, and that space is bordered with a gold design that reads “Noells.” The border is decorated with gold bells and red accents. This is an image of a red and white gift box tied with a yellow ribbon. The gift box sits in front of a blue background. This image depicts a drunk man at a Christmas party holding an empty martini glass. He wears a white collared shirt with a loosened red tie along with a striped party hat. Depicted in this image is a Christmas present wrapped in lime green paper with orange polka dots on it. The gift box is tied with a bright red ribbon. This is a red Christmas stocking with white trim. The stocking is in front of a two-toned yellow background. Depicted is a side profile of a newborn Jesus lying in hay in a wooden cradle. There is a rising yellow sun in the background.